Orbs are circular photographic anomalies caused by out-of-focus bits of dust or insects in the foreground of photos. Usually the 'orbing objects' are very close in to the camera (generally a few centimetres) in flash photos, but not always. For more in the theory of orbs see here. 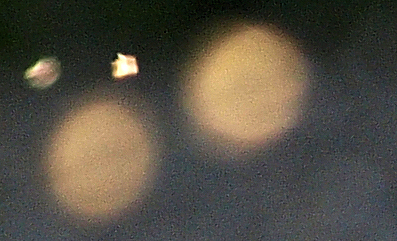 It is also possible to produce orbs further away from the camera using sunlit insects. You need a telephoto lens which pushes the orb zone much further away from the camera (up to a metre or two). This situation is rare in casual photography but it can happen. However, this technique was used deliberately in an experiment examining the formation of orbs. Unlike 'normal' orb photos, the orbing objects (insects) are at least visible at the time of exposure. Though they cannot be controlled they can at least be observed making it easier to manipulate experimental parameters. In the photo above, a swarm of midges, illuminated by sunlight from behind, was caught at the edge of the orb zone. Some insects are slightly further away than others and consequently in focus. Others are closer and so out of focus and appear as orbs. The angular shape of the in-focus insects is largely due to their movement while flying around. Later photos of the same swarm, taken later with a longer exposure and more zoom, turned the same insects into 'flying rods' (this page also shows the same insect swarm all in focus). The hand rail in the foreground is fuzzy because it is also too close to be in focus. The wall in the background is blurred as it is too far away to be in focus. Note how much bigger the orbs are than the insects that produced them! This second photo is of the same area, taken less than 1 second later. In that time, the insects have moved around noticeably. Some insects that were orbs now look like insects again and vice versa. The photo is darker because the exposure time was shorter. All the other exposure parameters were identical. Note how similar all the orbs look to one another and not a bit like the in-focus insects. * If there is a 'transitional' phase between orbs and insects it must be rare, given the lack of any obvious examples here. There is a possible example (blown up, right) in the bottom left corner of the top photo, where one of the insects appears to be surrounded by a tiny orb envelope. In the blow-up (right), compare the 'sharp' insect on the right with the blurred one on the left. The blurred insect (left) appears to be surrounded by a tiny circle, similar in colour to the nearby 'proper' orbs. It looks significantly different to the insect on the right, as well as the others in the main photo, which looks much more angular, brighter and more white than orange. Is this weird object an orb caught in the very act of being formed? This experiment explored the edge of the orb zone. It is clearly a sharp divide, given the lack of transitional orbs/insects. This experiment showed how insects can be in focus in one position and an orb a fraction of a second later in another. It captures orbs in the act of being formed. Exactly the same process occurs when 'normal' orb photos are taken except that the dust or insects are much closer to the camera and a flash provides the illumination. Sometimes people take flash photos of insects which are too far away from the camera to be turned into orbs. They produce shapes similar to those in the photos above. Some people have speculated that they might be fairies! Hopefully, not after reading this article!